This was a fantastic experience for my daughter that really allowed her to grow into a mature adult. 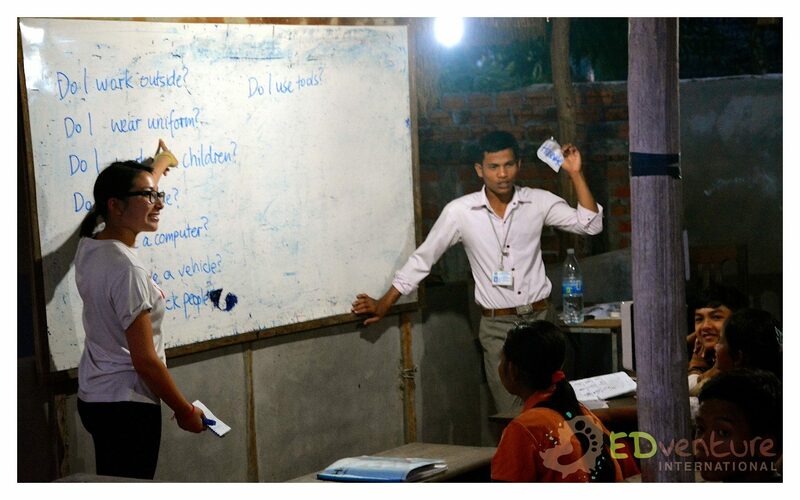 She originally signed up for the program herself to teach English in a disadvantaged community, but came back with so much more knowledge than either she or we expected. Originally, we were quite worried about her safety because before the program, my daughter had not travelled abroad by herself. Neither had she, or anyone in our family, previously travelled to Cambodia. Being a typical 19-year-old student who had grown up in Melbourne all her life, we were worried that her sense of judgement was still not mature enough to adapt to a completely different culture and situation. As a result, while she didn’t hesitate to sign up, we were finding it difficult to come to terms with her decision. For any parents who are contemplating on whether to allow their child to go on an Edventure program, my advice would be to trust in your child and respect his/her decision. If there is any place where I’d recommend you to give a chance to your child to prove that they are an adult, it would be with the Edventure program. We talked to our daughter during the trip and saw the great things she was achieving. Of course, it was definitely not all sunshine and rainbows. We saw how sick she became and how sad she was when she went to the landmine museum and watched documentaries on the history of Cambodia. However, we also saw how she overcame these and learnt from these experiences by herself, without the need of us being there. My daughter told me how the Edventure staff guided her through situations she found herself in that she didn’t know how to face. For example, being a more reserved person, she didn’t know how to lesson plan and teach a class of 40 students by herself. The staff were there to give her suggestions and created such a safe and friendly environment that boosted her overall confidence. She ended up loving teaching and actually contemplated on becoming a teacher. The learning didn’t stop in the classroom. The staff were there to push my daughter out of her comfort zone. Since she was in a different environment she learnt through interacting with the locals, making decisions for herself and working with other people from completely different backgrounds. She subsequently learnt many things from these interactions. I think most importantly, she learnt so many things you cannot get taught in school. She is now more mature, can make her own decisions and deal with problems, is responsible and more confident around and communicating with people. In Cambodia, she also met many people who were less fortunate than her, which has made her into a more compassionate and grateful person. She was definitely a more vibrant person when she came back to Melbourne. As parents, we have seen her growth and maturity. This has increased our mutual trust for each other and her ability to view situations from our point of view. These skills are transferable to the real world. I have no doubt that her experiences on the program were a factor that allowed her to find her first job related in her field (urban/town planning), as she would cite her experience on the program in her job interviews. All in all, this trip definitely opened her eyes and sparked her love for backpacking overseas. It was a learning experience for me too. Letting your child grow into an adult is something every parent has to go through, and the Edventure program is the ideal place to allow this to happen. My daughter never felt in danger under the guidance of the staff, but at the same time she was able to come out of her comfort zone and gain new experiences. It’s a difficult task to get this balance right, but I think Edventure has successfully done it. The outcomes I experienced were only possible because my daughter gave herself a chance to grow and we as parents gave a chance to her to grow. I would highly recommend Edventure to anyone.